Over the past three decades, Smile-A-Mile has evolved into much more than a summer camp. We are a year-round program serving children, and their families, from the moment of diagnosis and through the years beyond treatment. Over the past few years, it became clear we needed a place to carry out our extensive array of therapeutic programming. Smile-A-Mile needed a space that would serve as a safe haven and place of respite. Children and families, who are facing some of their darkest days, are able to come together in a place outside of the hospital setting to share in fellowship, support and life-enriching activities. After an extensive search, the Smile-A-Mile Place Committee chose a property in downtown Birmingham. At the end of 2015, we purchased a warehouse building at 1600 Second Avenue South. This building that was constructed in 1908 is in the perfect location with its proximity to Children’s of Alabama. This new facility is a revitalized piece of the evolving Birmingham skyline. Inpatient children at Children’s of Alabama are able to see Smile-A-Mile Place from the hematology/oncology floor and know this is a place of continued healing for them. In spring 2016, we began the renovation process. 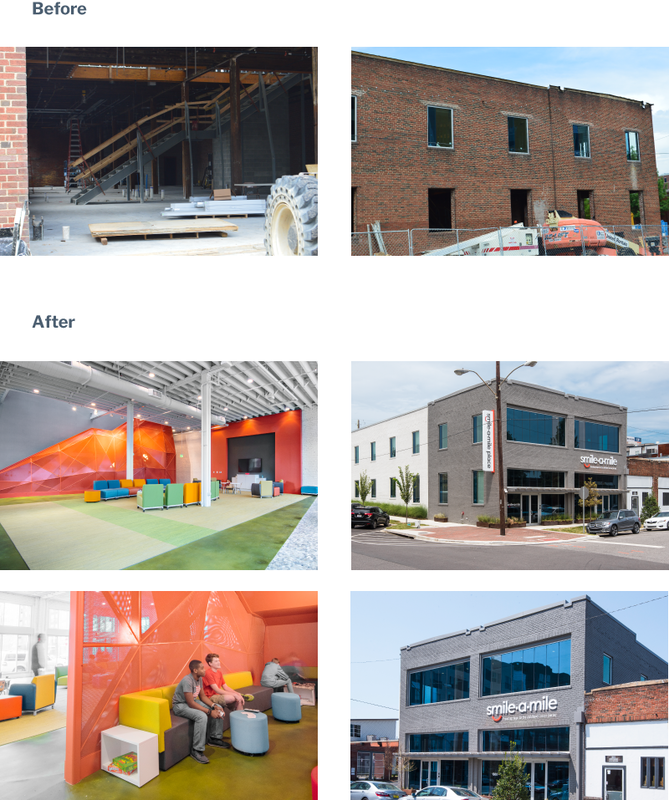 We worked with general contractor, BL Harbert, and design firm, Cohen Carnaggio Reynolds, to completely renovate this structure. The interior of the building was completely gutted and reconstructed into two floors. The first floor was designed for programming and special events space. Some programming also takes place on the second floor. The second floor also has office space for Smile-A-Mile’s growing staff. To serve as a safe haven and place of respite for children and families. To be a continued place of healing for pediatric oncology patients, survivors and families no matter stage of treatment or where they are in their cancer journey. To be a place where Smile-A-Mile can continue expanding its mission by providing year-round programming that is tailored for age, stage of treatment and family need. Smile-A-Mile is still in a capital campaign for Smile-A-Mile Place. For more information or ways to support, please contact us.